Michael Brewer of Brewer & Shipley. 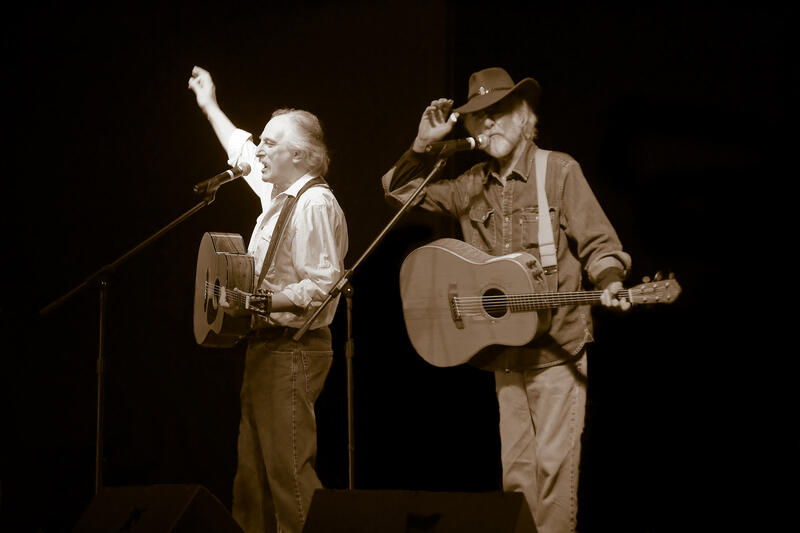 Michael Brewer and Tom Shipley, celebrating 52 years as a musical duo, perform at the Fox Theatre on Springfield's Park Central Square on April 20. They were one of the most successful folk-rock duos of the 1970s. Michael Brewer and Tom Shipley—Brewer & Shipley—are still making music together more than 50 years after they first teamed up. They’ll play a concert here in Springfield (Brewer says it’s the first time they’ve played here in a LONG time) next Saturday April 20 at the Fox Theatre on Park Central Square. In a phone conversation this week, I asked Michael to talk about how he and Tom first got together. “We both ended up as staff songwriters for A&M Records when it was brand-new label,” he said. “And we didn’t plan to be a duo, but we’d go into the studio and record demos on our songs for the record company to pitch to other artists. It didn’t take long to realize—both ourselves and A&M—that we kind of had our own thing happening. So A&M said, ‘Well, why don’t you guys record your songs?’ So we did. That’s how our first album, ‘Down In L.A.,’ came about, and that’s how we became Brewer & Shipley.” Last year marked the 50th anniversary of the “Down In L.A.” album, but as Brewer says, “We’ve been together 52 years.” And they’re “Still Smokin’,” as this year’s Brewer & Shipley national tour is nicknamed. I asked Michael Brewer if anyone ever told Welk what the lyrics actually referred to. He laughed and said, “I have no idea! We were in London at the time, so we didn’t see it, and didn’t even believe it. We went, ‘You’ve gotta be kidding—LAWRENCE WELK played it? !’ And he referred to it as a ‘modern-day spiritual.’ Well… it’s ‘gospel’ to us, I’ll put it that way.” Indeed, the song became an anthem of the 1970s counter-culture. After well over a decade of writing, performing and touring, the two Missouri residents got off the road and pursued various personal interests. Michael Brewer continued to make music with colleagues like Linda Ronstadt and Dan Fogelberg. Tom Shipley became a television producer/director, eventually starting his own video production company, Tarkio Communications, which has produced projects for PBS, commercial television, and industry. Shipley later founded the Oral History of the Ozarks Project, a non-profit organization producing documentaries about life in the Missouri Ozarks. In 1986, a classic-rock station in Kansas City asked Brewer and Shipley to reunite for a special concert to celebrate the station’s first anniversary. The Brewer & Shipley concert, produced by Fernando’s Productions with opening act 83 Skidoo, is Saturday April 20 at 7:00pm at the Fox Theatre in the History Museum, 157 Park Central Square. General admission is $20. For information call the History Museum at (417) 831-1976, or purchase tickest online at 417tix.com.